This week I had to write my article a little ahead of time as I will be out of the office for a few days. I went for an annual cleaning at my dentist and a routine X-ray showed that my lower wisdom teeth had turned sideways and were now completely impacted. You can’t schedule a toothache and it never fails that a major toothache hits when it’s late at night and your dentist’s office is closed, or you’re somewhere remote and getting to a dentist any time soon is just not an option. Anyone who has ever had the misfortune of a toothache knows that it is not just your mouth that hurts. Related: What’s The #1 Killer During ANY Crisis? It’s Not A Hurricane, An Economic Collapse Or A Terrorist Attack… And It’s Not Hunger, Gun Shots Or Looters! The Real Answer Will Shock You…It’s Deadlier Than All These COMBINED! A toothache can be felt in just about every part of your body. I have had a few so bad that they made me sick to my stomach from the pain alone. Although in most cases only a doctor can cure the source of the problem, this list of treatments & pain relief remedies should get you through until you can visit the dentist. It is important to note: If you have a toothache, there is a reason for it and it’s best to have it taken care of by a professional as soon as possible, rather than having it treated at home in hopes that the underlying issue will go away on its own. If it’s infected (if your gum area is swollen), don’t delay in getting professional medical care. Directions: Apply the below remedies directly to both the problem tooth and surrounding gums unless otherwise directed. For items that direct you to chew, or for liquids that are to be swished around inside mouth, direct the liquid on and around the sore tooth as much as possible. 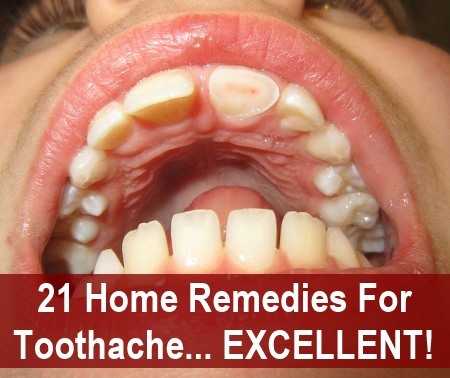 So here is a list with 21 toothache home remedies. Do not swallow liquids. Rinse your mouth and spit them out when done. Salt Water: Mix a heaping tablespoon full of salt in a small glass of warm water; swirl around inside your mouth for as long as you can, spit out. Repeat as needed. Hydrogen Peroxide: Swoosh a bit of hydrogen peroxide. If the taste is too horrid for you, try diluting with a bit of water. Alcohol: Swoosh a bit of whiskey, scotch, brandy or vodka. A strong mouthwash that contains alcohol will do the trick too. Vanilla Extract: Saturate a cotton ball with vanilla and hold in place. Can also use a cotton swab dipped in extract. Tea Tree Oil: Just a drop or two will do the trick. You can also add some to a cotton swab and hold in place or add a few drops of tea tree oil to a small glass of lukewarm to warm water and rinse your mouth with it. Oil Of Oregano: Mix a few drops with a bit of olive oil, then saturate a cotton ball with mixture. Can replace the olive oil with lukewarm water if preferred. Apple Cider Vinegar: Soak a cotton ball with apple cider vinegar (ACV) and hold it in place. Can also try regular household vinegar. Ginger Root: Take a fresh piece of ginger and chew it a bit. Garlic: Take a clove of garlic, smash it and apply (settle it inside cheek). You can also mash some garlic with salt. Peppermint Leaves: Chew on fresh peppermint leaves. You can also dried leaves, just hold them in place. Potato: Cut a fresh piece of potato (raw, skin off) and hold in place. Can also pound a piece of raw potato, mix in a bit of salt and use the mash. Lime: Cut a slice or wedge of lime and apply, bite into it if you can to release some of the juice. Onion: Slice a piece of fresh onion and hold it inside your mouth. The onion needs to be freshly cut (so it provides a bit of onion juice). Plantain: Chew up a fresh plantain leaf. If you’re too sore to chew, use the other side of your mouth. Once the leaf is macerated a bit apply it to the problem area and hold in place. Cucumber: Slice a fresh piece of cucumber and hold it over the sore area. If refrigerated, you might want to bring the cucumber to room temperature before using (if sensitive to cold) otherwise a cool piece can be soothing.You can also mash a piece with a bit of salt and pack it around the sore tooth. Cayenne Pepper: Make a paste with cayenne pepper and water. Black Pepper: You can use this full strength or make a mix of pepper and salt. Baking Soda: Take a cotton swab and moisten it with a bit of water, dip it in baking soda (coat the swab really well with baking soda) then apply. You can also make a mouth rinse by mixing a heaping spoonful of baking soda in a small glass of lukewarm to warm water, dissolve the soda then swish the mixture in your mouth. Cloves: This is remedy from the old timers (my great grandparents), rest a clove against the sore area until pain goes away. You can also use a drop or two of clove oil (BE CAREFUL: too much can be toxic) or make a thick paste of ground cloves and water or ground cloves and olive oil. Tea: Make a fresh cup of tea then take the used tea bag (still warm) and stick it in your mouth. Careful not to tear the bag. The tannins that are naturally in tea leaves can help numb things. Ice Pack: Cover an ice pack with a face cloth or towel then hold over your cheek where the problem is. This will help numb things. Make sure that you have some type of cloth between your skin and the ice, otherwise you can severely damage your skin.If that doesn’t work, try the opposite–a hot compress (making sure that it is not so hot as to scald your skin). If the pain is unbearable and there’s no dentist available, call your local hospital’s emergency room–chances are they have a dentist on call that can treat you (for a fee of course). Try gently brushing your teeth and flossing–this might bring some relief. One old time remedy that you should not follow is to place an aspirin against the sore tooth. You will have just as much if not more of an effect by swallowing the aspirin.Aspirin is actually an acid (acetylsalicylic acid to be exact) and placing it directly against your gums or teeth will cause corrosion of your teeth and acid burns on your gums. If the side of your face is in severe pain and it feels like you’re going to lose your mind (I’ve been there, done that)–it could be a sinus infection or an allergy that affects your sinuses rather than a problem tooth (even though it definitely feels like it).Try taking a decongestant or if that is not available, a shower set on the hottest setting may help clear your sinus cavities.This might help relieve things until you get to a doctor. Chances are a prescription antibiotic is what you’ll need to clear up the sinus infection.If it is a sinus infection please don’t wait to get it taken care of! I have permanent damage to my left eardrum from a sinus infection that became so congested it literally burst my eardrum as a pressure relief valve. Have I missed any of your tried-and-true methods to relieve tooth and gum pain? Please share it below in the comments section. Please be aware: These are notes I have collected in my personal life over the years, in my own research as well as tips gathered from my grandparents and great grandparents. They are not by any means professional medical advice and a trained dentist should always be contacted as soon as possible. P.S. If you have a toothache it may be in your best interest to go on a soft food diet until you get to the dentist.